It is clear that, as a result of the voltage-dependent increase in Na+ permeability, some Na+ ions will flow from the outside of the cell to the inside of the cell. A frequently asked question is whether the flux of Na+ that occurs during the action potential produces a concentration change on the inside of the cell. Alternatively, because of the increase in K+ permeability during an action potential, there is a tendency for some K+ to flow out of the cell. Does that flux of K+ cause a change in the intracellular K+ concentration? Although some Na+ does indeed enter the cell with each action potential and some K+ leaves the cell with each action potential, these fluxes are generally minute compared with the normal intracellular concentrations. For example, as a result of an action potential, the change in Na+ concentration for a 1-cm2 surface area of the membrane is equal to only approximately 1 pM (1 x 10"12 M) and that concentration change is restricted to the inner surface of the membrane. Therefore, even though some Na+ does enter the cell with each action potential, the concentration change is minute compared with the normal millimolar concentration of Na+ within the cell. Some K+ also leaves the cell during an action potential, but the concentration change again is minute compared with the normal K+ concentration. Indeed, if the (Na+-K+) exchange pump is blocked in the squid giant axon, it is possible to initiate more than 500,000 action potentials without any noticeable change in either the resting potential or the amplitude of the action potential. The role of the membrane (Na+-K+) pump is to provide long-term maintenance of the Na+ and K+ concentration gradients. 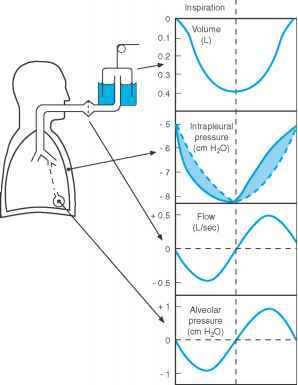 Eventually, if one were to generate more than 500,000 action potentials, there would be a change in ionic distribution, but this is a long-term phenomenon, and in the short term the (Na+-K+) pump is not essential. Even with the (Na+-K+) exchange pump blocked, a cell is capable of initiating a large number of action potentials without any major change in either the resting potential or the peak amplitude of the action potential. If the resting potential is unchanged, it can be inferred that the K+ equilibrium potential is also unchanged. Similarly, if the peak amplitude of the action potential is unchanged, the Na+ equilibrium potential is also unchanged.